It is almost a fact of life that video games and the big screen don't jive together. There's just something about the narrative nature of both that contradict each other and make bad games possibly into great films and make great games possibly into bad films. With "Wreck-It Ralph", Disney tries to break that mold and surprisingly, it turned out to be amazing. "Wreck-It Ralph" has a deadly combo for both adults and kids - nostalgia for the adults and a fun, simple story plus new interesting characters to entertain the kids. Ralph (John C. Reilly) is tired of being overshadowed by Fix-It Felix (Jack McBrayer), the "good guy" star of their game, "Fix-It Felix", who always gets to save the day. But after three decades of doing the same thing and seeing all the glory go to Felix, Ralph decides he is tired of playing the role of a bad guy. He takes matters into his own hands and sets off on a game-hopping journey across every generation of video games to prove he got what it takes to be a hero. On his quest, he meets Sergeant Calhoun (Jane Lynch) from the first-person action game "Hero's Duty". But it's the feisty misfit Vanellope von Schweetz (Sarah Silverman) from the kart racing game, "Sugar Rush", whose world is threatened when Ralph accidentally unleashes a deadly enemy that threatens the entire arcade. "Wreck-It Ralph" solves one of the biggest conundrums when it comes to computer-animated films. Some films from this niche are designed for the younger audience and adults are left out of the fun. But "Wreck-It Ralph" on the other hand provides a win-win situation. Adults get to enjoy the numerous cameo appearances from video game characters of yore while the younger ones get to enjoy the main characters who provide some new school kicks and drive the story forward. No one gets left out as the on-screen references and jokes don't affect the story and the new, fictionalized additions prove to be interesting themselves. The animation and grpahics is also top-notch with its rich, vivid and colorful visuals and animations that differentiate per video game character (another ode and reference for the older generation). The only quirk with "Wreck-It Ralph" is that it proves to be overtly simple to the point that its main message gets muddled up a bit. 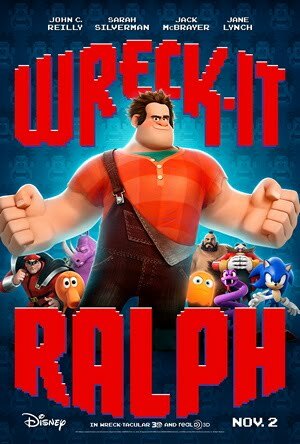 Otherwise than that, "Wreck-It Ralph" is the perfect ode on video game love for geeks and non-geeks, adults and young-ones.